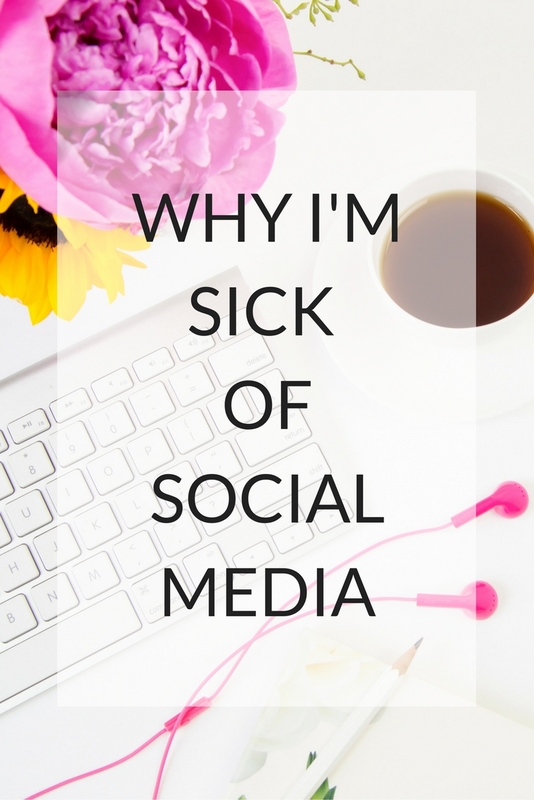 Time for a bit of truth: I'm sick of social media. Social media can be an absolutely brilliant thing if used correctly but it can also have a hugely negative impact on your life and mental health and I've experienced that to the fullest recently. No matter how many times I've tried to disconnect from the internet or avoid my phone, I always find myself scrolling aimlessly through instagram and twitter. Social media has become an addiction to our generation and it's an addiction no one wants to beat. I wake up. I check my phone, check my emails, check instagram, check twitter, check youtube. Repeat. This seems to be the recurring theme every single day and for some reason I can't get out of it. Even if I'm watching a TV show or reading a book, two minutes in I'll be reaching for my phone, without even realising, to do the subconscious mandatory social media scroll. I'm not someone who gets validation through likes or views, to be honest I couldn't care less how many likes I get, it makes no difference to my life whatsoever. I don't scroll through social media looking to see new followers or more engagement, I think I do it because I'm subconsciously looking for something more interesting than the last thing I read, something to distract me from life for a while. Loneliness doesn't exist like it used to in our generation. You can be completely alone yet have an abundance of entertainment and people to follow and live your life through theres. No one sees the danger in this until it's too late. You've spent so long on social media you've missed out on living your own life. I feel like I have social media drilled into me. Anywhere I go I immediately try and see if I can get a good instagram of myself or the surroundings, as if it's essential to make a perfect portfolio of my life online. I was in a cafe last week and I tried to pick the seat that had the best lighting so I could get a good picture for instagram. What the hell is wrong with me?! How have I gotten to this point where I live my life according to the standards of what's popular on social media. Not to mention the amount of time I spend applying filters in several different apps to make sure the picture blends in with my instagram theme. Life doesn't come with a theme! Who cares! And if I haven't posted in a week and I see my followers go down, it's like a subliminal pressure to please these strangers on the internet who I have no obligations to. It almost feels like I have a group of people that I have to go out of my way to keep happy. Part of me would love to delete all of my social media and disappear from the internet completely. Go off the grid, start living in the world. It's amounted to so much pressure and stress that I find it very hard to enjoy it anymore. I enjoy writing and being creative, it's just a shame that I have to be part of the social media circus that comes along with it. I don't want to completely disappear off the internet because it gives me a voice, it enables me to write about things I care for. I'm still trying to find a way to manage the stressful side of social media so I can still the enjoy to freedom of creating. A great way for me to de-stress and relax when I'm feeling a bit overwhelmed is to read. Reading really relaxes my mind and takes me away from the pressures of social media. At the minute I'm reading The Year I Met You by Cecelia Ahern, it's a great a book and you should check out some of her other books if you're into reading too. Social media gives me no fulfilment, if anything it has drained me and had a hugely negative affect on my mental health. I find myself in a negative headspace, more times than what's healthy, due to being attached to this thing that I can't seem to let go of. If I wasn't in the blogging/social media world I definitely wouldn't use any social media apps at all, but it's something that's mandatory in this field of work. I've never finished scrolling through social media and felt happy and inspired, in fact I'm always left feeling down and depressed from it. Yet myself, along with millions of others who are affected by it, can't seem to help it. We know it's bad for us but it constantly reels us back in without realising. It's an addictive cycle and it's one I've come to hate. I guess I'm just tired of it all. I'm tired of being tired. I don't have a solution to it yet but I'm working to find a way to use social media more effectively as a work tool rather than in my personal life. I'd love to know your thoughts on this and if social media has affected you in a similar way. It did affect me the same. It became too toxic that whenever I go out with friends, I realize that we were just all together physically and we don't even talk without holding or scrolling through or phone. It was when my phone started to have issues that I started to not bring it when I go out. That's when I saw how social media affects me in a bad way. Since my friends has their phones, I was talking to them and no one seemed to be attentive because they're looking through their phones and social media. Same as being a writer. Scrolling through facebook makes me feel distracted. Sometimes I'm forgetting my deadlines and sometimes, I can't seem to write anything at all. I decided to be Missing In Action when the year started. 4 months into hibernation, with limited access to social media and internet made my creative juices flow again. I mean, it's not a sin to like using social media, but its bad when it consumes you already. You know what you're so right, I barely ever come off of social media feeling happier and better about myself, it's usually the latter! Sometimes I'd really like to just abandon social media altogether but it's so difficult if you want to get your blog out there and even most jobs now have a social media component to them. I totally agree with this! For me, I've found that apart from messaging, I no longer spend much time on Facebook and its such a relief to feel like I'm not currently missing out all the time. Scrolling through it for hours just generally doesn't help with my insecurities. I tend to minimize my social media so that I'm not currently consumed with it. I can enjoyably scroll through Instagram for ages because I know just how curated all these images are so it doesn't really affect me - plus I tend to stick to looking at art on there anyway! Apart from that, all I really use is YouTube to watch videos rather than actually posting them myself. Such an insightful post! I am currently in a 3 week social media blackout. It has been great! I plan on extending it and making so major changes to my usage when I return. So I've been there and done that and I spent 6 months with so much anxiety that I was barely posting anything and I'm a full time blogger! Do you know how harmful that was for me in the long run? At the end of the day it was necessary for me to sit back and asses what's real and what I value online. For example, I enjoy connecting with like minded people who are authentic and who inspire me to do more. I don't however want to see people showing off what they have. I learned there is a big difference between the two and it mainly stems from how you talk to your audience. I've also learned how to put on my blinders. I try not to let the show offs get to me and I focus on my journey and how proud I am to be here and be doing what I'm doing as a career. At the end of the day, you have to be happy with whatever it is you do. It's harder to get on track now because of social media but you can get there. Take some time for you, force yourself to have a social media break and soon you'll start to feel like yourself again. I hope this helps. Thanks for writing an awesome post. We've all been there and it's good to here another perspective. This is how I've been feeling for a few months. I think it's all a state of mind. It does reel you back in. I think it would be easier if we had more self control. I know I need more of that for sure. Thanks for this post. I'm glad someone else feels the same. Of course my darling, I do agree with you,specially with the facts, that after we stop scrolling thorugh the news feeds of facebookor instagran you tend to feel so down and even depressed (I say it because it's my situation) and the reason its because you compare yourself with other people so you start thinking stupidipidity (my fun word for stupid) stuff about your presonality, why this thy that, and so on, and I think that is the beginning of depression. We need to forget about social media stuff and start living our life (we can't just quit them because sometimes we need them) in the way we lived before social media took a great space on our lives. I love this realness of this post. I've been feeling so much of the same way! It's so true that there are positives to social media but at the same time it's so hard not to constantly be scrolling. A couple months ago I purposely just set all my social media apps on the last screen of my phone and turned all my notifications off so that I could try to stay away more! I couldn't relate more to this. Like, the worst of all is the fact of the things shared online as looking for attention from people and I hate to feel that way. Also, when it comes to facebook oh dearly ... the amount of irrelevant things shared there like what people ate, what they did, who were they with etc. and the misspellings? Better don't even start. I don't know if you do the same as me, but when it happens I shut down and focus on myself and doing things I like and are of my interest. I really agree with everything you said, I grew up in the 90s and in High School I didn't even get a cell phone until senior year lol but it was so fun to really be engaged with your friends and make time to sit and actually talk with your friends. I have a 6 year old and I plan on not allowing social media as much as I possibly can so that they can experience the real beauty of being in the moment.